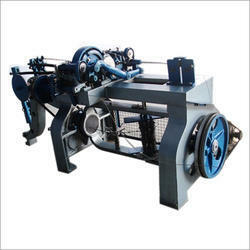 We have a team of self-motivated and proficient procuring agents who help us to provide Barbed Wire Machine. “Bhagwati Engineering Works”, incorporated in the year 1975 is a well known and reliable manufacturer of a qualitative and wide assortment of Hacksaw Machine, Hydraulic Press, Lathe Machine, Planer Machine, Power Press, Radial Drill Machine, V Belt Pulley, etc. Located at Batala (Punjab, India), we have developed a well functional infrastructural unit where we manufacture this range of machines and accessories in diverse specifications. We are a renowned company that is actively committed to providing an extensive range of machines and accessories. Managed under the headship of our mentor, “Mr. Vishal Aggarwal”, we have covered foremost share in the national market.